every new customer you refer to The VA Team Ltd.
As with any other affiliate program, once you sign up you will receive your own unique affiliate link to www.thevateam.london. You can share this link via email, IM, Facebook, Twitter, on your website or blog or anywhere else. Simply refer the customer to our website and we will do the rest. When a new customer follows your link and purchases one of our packages, you will receive commission. You will earn 10% commission for every new active customer who signs up through your referral link and 20% commission of all their future monthly payments for the life of their account. As you refer more and more new customers your automatic recurring revenue can really begin to add up. Your affiliate commissions will be paid monthly via PayPal. If you already have an account with us you don’t need to create a new one, just login to your dashboard. If you don’t have an account with us, sign up here, it will only take a minute. Anyone can become an affiliate. And it’s free of course. Do you provide marketing materials? We sure do! We offer graphics that you can use on your website, blog or social media to increase your rate of referrals. Just make sure to use your unique affiliate URL to link the graphics to The VA Team website. If you need another size or a different graphic for better integration into your website or blog, please contact us at info@thevateam.london. Where can I check my earnings? 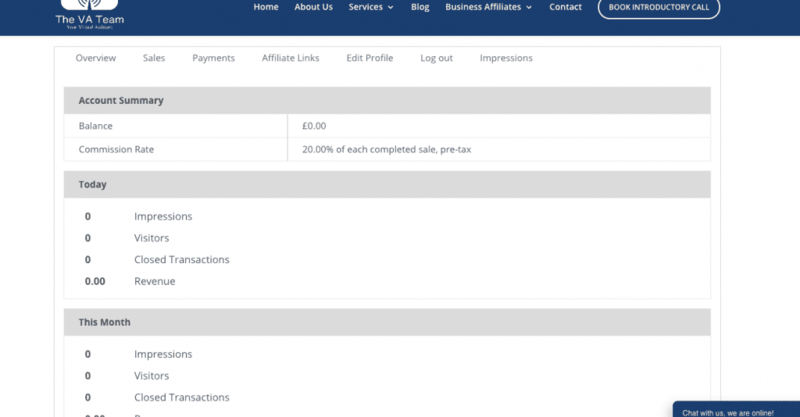 There is an Affiliate section available via our website where you will see your dashboard showing your referral link, configuration of PayPal, check your earning in real time and view all the transactions. If I have more question or a problem who do I ask? Log into your account and there is a Live WebChat service that you can get to speak to one of our team that will be able to either get the information over to you or get a senior member of the team to help you. Oh, and one more bonus reason to join us: there’s no cost to you to be part of the program. No sign-up costs, and no ongoing fees or monthly payments. If you’ve been looking to dip your toes into affiliate marketing, this could be an amazing fit. We are so excited to share this opportunity with you and help you build a new income stream of your own! Working with a Virtual Assistant. Why Business owners hire a Virtual Assistant! หนังxxx on Virtual Personal Concierge and Why Do I Need One?